Imagine setting up all of your home’s electronic systems so that the tasks they do are automated or controlled with the touch of a button on your smart phone, tablet, or a wall‐mounted or wireless touch screen. 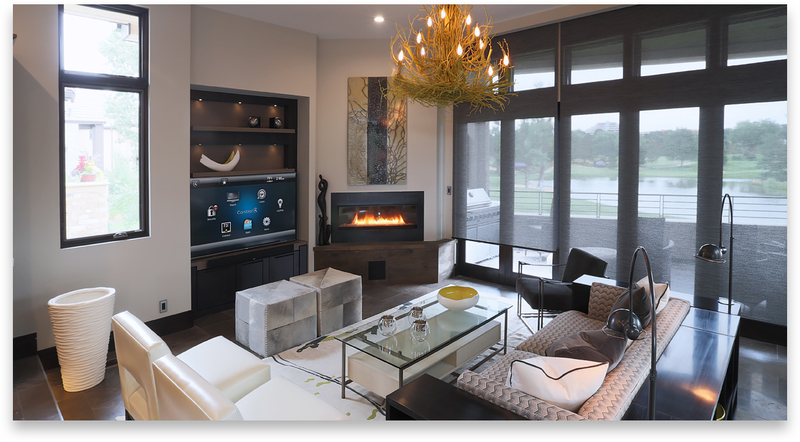 Such a home automation system would simplify everyday tasks so you would have more time to enjoy what’s important. For example, we can set up your home so it locks itself at 10 p.m. Or set it up to automatically close your shades when direct sunlight hits them. Customized solutions by MediaTech are designed to enhance your comfort, convenience, entertainment, and peace of mind by offering interactions that integrate with your lifestyle and environment. We work with the best product providers in the industry to offer you the highest quality experience imaginable. Still wondering what our home automation services can do for you? Here are a few examples of the many possibilities offered by MediaTech. Do you like to entertain? When guests are about to arrive, switch to an “entertaining” mode with lights, music, shading and climate all at optimal levels, all by pressing just one button. Do you like movies? When you start a movie, your system can dim the lights, close the shades and switch the volume to the perfect level. Want to have your home wake you up in the morning by opening the drapes in your bedroom, turning on the news and the coffee maker? Our home automation systems let you set up sequences of any events at any time you choose (or we can set them up for you). When you leave your house, set your home systems to a pre‐planned “away” mode. Certain lights turn on and others turn off. Unneeded systems such as TV and music turn off. Climate sets itself to a lower level and your security system activates. Want to check on your home while you’re away? That’s simple, too, using your smart phone, tablet or any computer with an Internet connection. Check the security system, make sure your garage is closed, and turn lights on or off. If you have workmen coming to your house, let them in remotely, and then watch them via your security cameras. Let your house know when you plan to return so it can be ready for you – or if you’re not sure, switch it to arrival mode when you’re a few miles away. Are you worried about the environment? Properly‐designed home automation systems are very green, significantly lowering energy costs and your carbon footprint. Setting up all your smart home systems to work together can be a complex job, but that’s where our expertise comes in. Once we’ve set up your home, you can relax and just enjoy it. Learn more about home automation solutions from MediaTech, Control4 or Savant, backed by our one‐year warranty, extended maintenance agreements and 24/7 emergency service. Contact us for a free consultation.